Just steps from the buzz of Bloor St. in Toronto, the InterContinental Toronto Yorkville is offering guests an experience unlike anything else – the chance to dine in heated, transparent igloos that provide warmth and comfort, while surrounded by winter. Until the end of March, the hotel’s Proof Patio has become a winter oasis, boasting a special Igloo food and drink menu, including an Ice Luge that will be used to serve up specialty cocktails. The special Igloo menu was created by InterContinental’s culinary team, featuring mulled wine or warm spiced cider, a choice of Puneet’s butter chicken or mushroom and leek ragout bread bowls, followed by house-made truffles. Peller Private Reserve Ice Wine will be served with the ice luge, and cocktail specials include the “IGLOOsive” Wayne Gretzky 99, in partnership with Wayne Gretzky Estates Winery and Distillery. 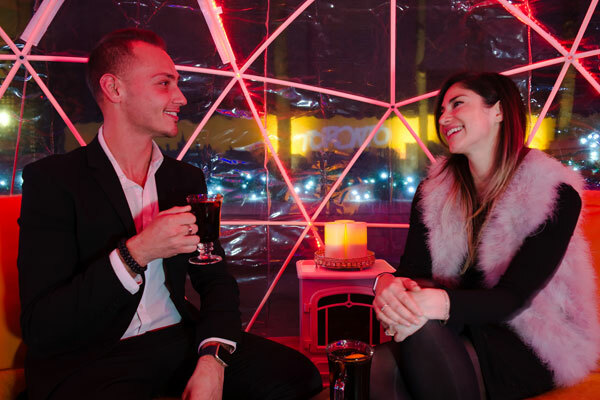 Due to limited seating and high demand, the Proof Igloos have a two-hour seating time limit and are available daily from 4 p.m. until 10 p.m. Advance reservations are encouraged by calling 647-464-3310.